St. Christopher Magallanes is a martyr and saint venerated in the Catholic Church. He was killed without a trial, on the way to Mass during the Cristero War, after the trumped up charge of inciting rebellion. He was born in Totatiche, Jalisco, Mexico on July 30, 1869. His parents were Rafael Magallanes and Clara Jara, farmers. As a youth he worked as a shepherd and enrolled in the Conciliar Seminary of San Jose in Guadalajara at the age of 19. He was ordained at the age of 30 at the St. Teresa Temple in Guadalajara and served as chaplain of the School of Arts and Works of the Holy Spirit in Guadalajara. He was then assigned as the parish Priest for his hometown of Totatiche, where he helped found schools, carpentry shops and the planning of hydrological works including the dam of La Candelaria. He had a special interest in the evangelization of the local indigenous Huichol people and was instrumental in the foundation of the mission in the indigenous town of Azqueltan. In 1914, government decrees shut down the seminary in Guadalajara. Fr. Magallanes offered to open a seminary in his parish. In July 1915, he opened the Auxiliar Seminary of Totatiche, which quickly achieved a student body of seventeen students by the following year. The Archbishop of Guadalajara, Bishop Jose Francisco Orozco y Jimenez, recognized his efforts. The Bishop appointed a precept and two professors to the seminary. Christopher wrote and preached against armed rebellion, but was falsely accused of promoting the Cristero Rebellion in his area. He was arrested on May 21, 1927, while in route to celebrate Mass at a farm. He gave away his few possessions to his executioners, and gave them all absolution. Without a trial, he was martyred four days later with St. Agustin Caloca in Colotlan, Jalisco. His last words to his executioners were, “I die innocent, and ask God that my blood may serve to unite my Mexican Brethren”. His successor assigned to his parish in Totatiche was Fr. 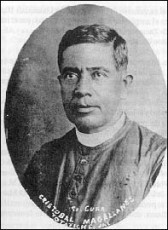 Jose Pilar Quezada Valdes, who went on to become the first Bishop of the Archdiocese of Acapulco. Pope John Paul II canonized him on May 21, 2000. He is celebrated in the Roman Catholic Church with his feast day on May 21. A movie about Fr. Christopher Magallanes and his companions was made called “For the Greater Glory”, a story about the unjust persecution of Catholic Priests in Mexico. Actor Peter O’Toole portrayed his life. St. Christopher Magallanes is a martyr and saint venerated in the Catholic Church. He was killed without a trial, on the way to Mass during the Cristero War, after the trumped up charge of inciting rebellion. He was born in Totatiche, Jalisco, Mexico on July 30, 1869. His parents were Rafael Magallanes and Clara Jara, farmers. As a youth he worked as a shepherd and enrolled in the Conciliar Seminary of San Jose in Guadalajara at the age of 19, and was ordained a Priest. He opened a seminary in his parish, when the Government decree mandated that the Seminary in Guadalajara be shut down. A movie about his life was made by Hollywood, “For the Greater Glory”, showing the unjust persecution of Catholic Priests in Mexico.